We are going to insert the data into mysql table ‘sample’. We will use Java programming language for doing the same. In case you missed how to connect your database with the JAVA programming language, you should refer this link below. Once you establish the connection with MySQL database, all you need to do is to select a table and insert desired data into it with the help of executeUpdate(query) method of Statement object. The executeUpdate(query) returns number of rows which got updated in the process. After inserting one record into the table, if this method returns 1, then we can say that the record got inserted successfully. Rest of the things are same as the previous post, the only thing which is different has been discussed above. So please have a careful look at the program below. above. So please have a careful look at the program below. The output screenshots are shared below. 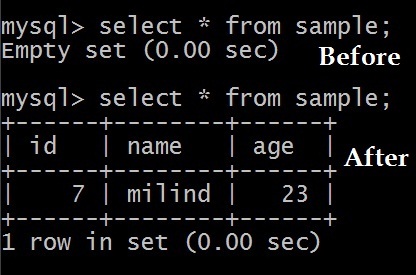 2) And the MySQL command line changes from Empty Set to 1 Row in Set. Thank you for having a read and suggestions are always welcome.